On Sept. 23, the Oklahoma farmer and priest Stanley Francis Rother will become the first U.S.-born priest to be declared blessed. The beatification will take place in Oklahoma, a state where Catholics comprise only 6 percent of the population. No matter how impressive, however, statistics are not what make this missionary disciple from the town of Okarche most remarkable. In Santiago Atitlán, Guatemala, the village Father Rother served for the final 13 years of his life, the people remember and honor a faithful priest, a farmer who plowed the fields alongside them, a shepherd who proclaimed the Gospel with his life, a courageous man who chose to remain with them even when violence threatened—and eventually took—his life. He was a pastor whose love was expressed, above all, by serving, by doing whatever Christ asked of him. Through his faithfulness and gift of presence, Padre Apla—the name his Tz’utujil Mayan parishioners gave him in their native tongue—embodied the essence of a true disciple. He was a pastor whose love was expressed, above all, by serving, by doing whatever Christ asked of him—even when it seemed impossible, like completing his seminary studies after failing the first year of theology. In a manner both humorous and courageous, the seminarian who struggled with learning Latin became the missionary priest who not only learned Spanish but also became completely fluent in the rare and challenging Tz’utujil language. Then and always, Father Rother put himself completely into the Lord’s hands, with confident trust in divine providence. He lived a life of heroic virtue with a keen awareness of God’s presence in the small and quotidian moments of parish life, as well as in the unfamiliar and often unexpected events of missionary life. In 1975, at the young age of 40, he became the sole priest and pastor at the Oklahoma mission La Iglesia Parroquial de Santiago Apóstol (St. James the Apostle), which served 25,000 Tz’utujil parishioners. From celebrating Mass and the sacraments to building a clinic and fixing machinery, Father Rother imitated Christ’s model of servant leadership. And when Guatemala’s violent conflicto armado interno, or armed internal conflict, made its way to the remote village on the shores of Lake Atitlán, his priestly duties expanded to include heartbreaking tasks like walking the roads searching for the bodies of the desaparecidos, parishioners who had gone missing. 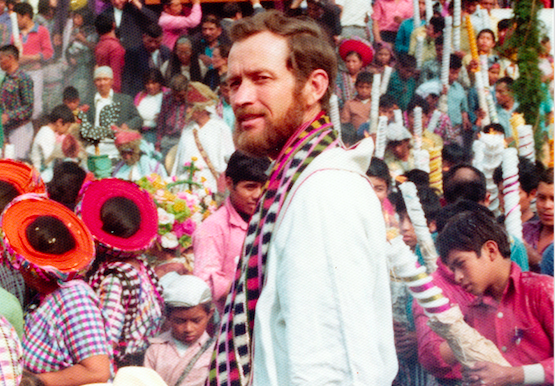 Our missionary journey to the peripheries of our lives will inevitably be different from that of Blessed Stanley Rother. But ultimately, the question we must answer is the same: What is God asking of me today, in this moment, in this place? If anyone can model this call to holiness in the midst of our very ordinary lives, it is the farmer from Okarche. He would tell us that it all begins with our willingness to say yes to whatever—and whomever—God has placed in front of us. This article also appeared in print, under the headline "An Oklahoma Martyr: Stanley Rother will be first U.S.-born priest beatified," in the September 18, 2017 issue. María Ruiz Scaperlanda is an award-winning journalist and author. The Shepherd Who Didn’t Run: Fr. Stanley Rother, Martyr From Oklahoma is her sixth book.